How to use: Apply it after (with or without) primer base, using beauty blender or sponge, stipple in the face slowly, the bb cream will blend into the skin quickly. Who is it for? All skin types except Oily and acnaic skin. It’s actually the base makeup for school or if I want to go to the nearest mall for a while. As much as you know that BB cream cannot be worn for more than 5 hours because it will be gone and your natural skin will appear, all the pimple and everything. It’s also not for high covered. However BB cream is suitable for those people who are afraid that acne or pimples will come out that they need to wear makeup every day. This is the right fit, other than this product, I will recommend Sephora foundation because it’s non-comedogenic, fragrance and oil free, but even thou its foundation but it’s not going to cover all your face and only wearable for 6 hours. I will give this review in the next post. I like this product because the tone/shade matches my natural skin tone and I feel my skin appear smooth and flawless when I use it. At first, it just a give because I purchased more than SGD 100, they give 2 sample box, but it’s actually for the older version the blooming fit, perfect fit and cotton fit. The newer version is Etude Precious Mineral BB cream cover and bright fit. Not suitable for oily skin because the makeup can move. Will I recommend this product? Yes, but only for specific type of skin that I mentioned above. 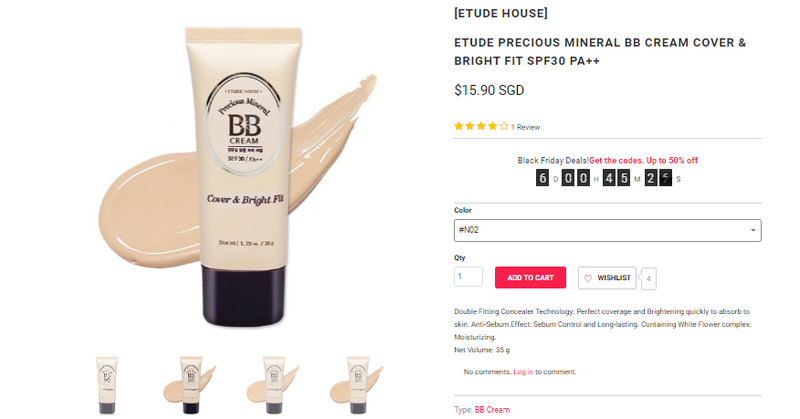 Have you tried Etude Preciouse Mineral BB cream? spill your tea in the comment!